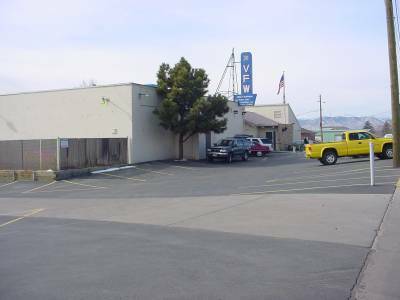 The forlorn looking building on 3800 S King St, across from the beer tavern, Monaghan's, in Fort Logan, was not a propitious start of VFW Post 9644. The building was dismal with its rattling windows, leaky roof, and weather beaten exterior. Even the rats had forsaken it in their search for food. Named for Verle J. Huffman A. S. N. who joined the service at Fort Logan on January 29, 1937, in the Second Engineers, he served three years, before re-enlisting, when he sailed for the Philippine Islands. He was reported missing in action on May 7, 1942. On June 16, 1942, Verle was listed as dead from dysentery and diphtheria at Cabanatuan Camp, Philippine Islands, while a prisoner of war of the Japanese. At the mustering date on December 2, 1946, the situation was critical when four or five members huddled around a small oil burner in their effort to keep warm. There was no furnace and the boarded up windows let out more than the thin shafts of light. The rent was past due, Christmas was near. Many members were without jobs and their own rent at the Housing Project was due . The incentive for joining the VFW Post was practically nil because of the little it had to offer. How was this VFW Post to follow the motto of "Honoring the Dead by Helping the Living" when from all outward appearances it could not even help itself? Commander Paul Box gathered his forces and prepared to meet the issue by rallying their spirit of comradeship and the challenge to survive in the spirit of the Post's namesake. The spirit of self-satisfaction in service to others was deeply instilled in each comrade and evident in each Charter Member when the Verle Huffman Post 9644, Fort Logan Charter was signed on December 2, 1947. It was instituted the next day on December 3, 1947, with 33 Charter Members. The Post went to work. Bingo games, turkey raffles, football pools were all given a try. Because of the fighting spirit of these men, a Christmas party was given for the droves of community children came and returned home with candy, fruit and gifts. These few men also raised funds enough to create twenty-five Christmas baskets for the needy and paid rent for those who were in danger of being evicted. In 1948 the post moved to their present location at 2680 West Hampden Ave, shown in picture on the left. In 1949 they led the entire Department of Colorado in membership and today they boast a membership of 695 members and has been going strong for 54 years in the city of Sheridan Colorado. Their donations have expanded to include Veterans, schools, ball team, scholarships, community, friends in need, and many, many other projects, including a Ladies Auxiliary, formed in 1948. The Auxiliary is an association of overseas veterans and their wives, mothers, daughters, granddaughters, stepdaughters, and sisters dedicated to preserving and strengthening comradeship among its members, and to assist Veterans, community, and their children. The Charter was signed February 20, 1948, with sixteen members. As of 2001 the Ladies Auxiliary has 486 members. Paul F. Box, James A. Stratton, James M. McDonough, Michael J. Barry, Charles G. Allendorf, William. L. Beringer, Henry Barron, William O. Apgar, Roland G. Price, Merle H. Bransom, James W. Webb, Donald M. Overstreet, Floyd L. Hunter, Harold Y. Neff, George H. Sunada, Charles W. Smith, John H. Ahrens, James N. Jones, Cecil J. Basgall, Robert G. Basgall, George A. Naulty, James A. McCormick, Kelly E. Galubenshee, Ernest Schaul, Jacob Naulty, Elijah Craddock, Thomas A. Taylor, Charles F. Lavasseur, Robert L. Stevenson, Robert E. Box, Charles Rathbun, Everett F. Pierson, Charles W. Smith, Jr.
Marilla Allendorf, Lillian Apgar, Juanita Box, Amelia Gootee, Virginia Hunter, Marie Jones, Florence McCormick, Catherine McDonough, Donna Neff, Eula Pierson, Geraldyne Pilchard, Clarice Sittler, Geneva Stratton, Susan Sunada, Clara Taylor, Carolyn Webb.